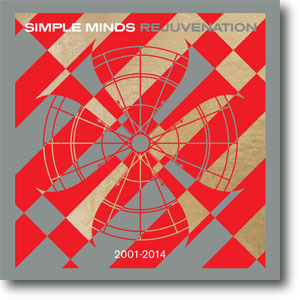 Rejuvenation was the first release by Demon Records who purchased the rights for Simple Minds' back catalogue from 2001 through to 2014. This encompassed the band's period at Eagle Records, Sanctuary Records, Universal and Caroline and included the albums Neon Lights, Cry, Black And White 050505, Graffiti Soul and Big Music. "Originally released in October 2001, Neon Lights is a collection of cover versions put together as a warm up for what would be the next album Cry. Jim said at the time: 'Neon Lights is the first time Simple Minds have put together a collection of non-original material. We thought it was appropriate at a period of looking back that we go to the very foundations of Simple Minds, which of course is the music and the bands who influenced us." The albums were pressed up on coloured 180g vinyl and collected together as a box-set. It was the first time the first three albums had appeared on that format, and the artwork and inner sleeves were based on the original CDs and booklets. Cry was released by Simple Minds in April 2002 and was recorded in Sicily and Glasgow. Talking at the time, Jim said, 'I like the idea of very focused melodies, tight arrangements, commercial stuff. I said to Charlie 'This is the only kind of music I want to make just now. Let's try and go on the edge and do some real pop stuff.'" Some of the albums were augmented with extra tracks. 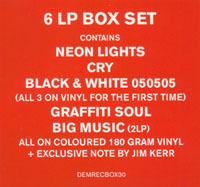 In all cases, these corresponded to limited edition CD releases in other territories: Neon Lights was based on the US Pressing which added the bonus tracks Being Boiled and Love Will Tear Us Apart; Black And White was based on the Black And White 050505 Japanese import which included Too Much Television; and Graffiti Soul was based on the standard CD which featured Shadows And Light and Rockin' In the Free World. "Work started on this follow-up to Cry in 2002 and was heavily influenced by the band's live work from that period. 'Having delivered Black And White 050505, an album that we believe is classic Simple Minds , albeit with a whole new energy. We can honestly say that we are delighted with the results and look forward with a totally revitalised outlook to this next phase of our on going creativity.'" Original sleeve designers Fabrique were contacted for help with Neon Lights and Black And White 050505 to get original pictures of the sleeve designs. At one point, there was talk about reshooting the cover for Neon Lights if the original picture couldn't be found (and perhaps using a CD instead of a cassette). There was also a discussion about the reversed picture on the front of Cry and whether it should be changed. In the end, the original artwork was presevered. "Graffiti Soul was released in May 2009 and continued Simple Minds return to the top, charting at #10. 'We would create ideas and work on those ideas for hours. That's the way we worked upon Graffiti Soul's tracks; we worked upon ideas and just let them evolve over long periods of time.'" 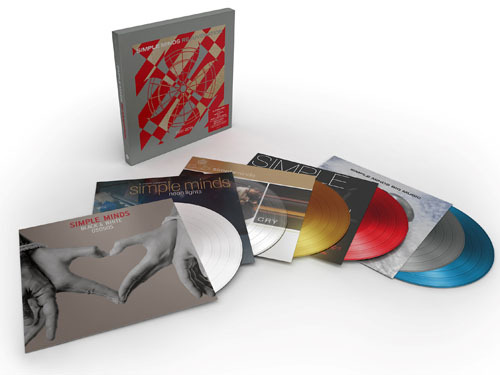 The box-set's artwork was based on the logo for Big Music and elements of an unreleased design for a proposed single. The transparent disc of Neon Lights matched the cassette case on the original sleeve. Gold matched the colour scheme of Cry. Black And White 050505 had to be pressed on white vinyl. Red matched the colour scheme of Graffiti Soul. And the grey and blue colours of the Big Music discs corresponded to the sky on the sleeve. "The final album in the box is the highly acclaimed Big Music, released by Simple Minds in October 2014 and reaching #12 in the UK Charts." Jim wrote the notes on the back of the box whilst on tour in America. This is why he signs off in New York City.